Ron Schilling has been in prison for over 32 years. His co-defendants are out of prison. He was eligible for parole in '87,has been a model prisoner and yet still sits. As well as garnering support for Ron,we hope here to generate concern over the gross injustices within the parole system. Ron got a notice of non delivery from the mail department at his prison. They did not tell him what the mail was or from whom except to name the document number. They destroyed the mail :no due process- . This needs to be pursued. Even a littel dent here in this case would make a big differnce. Mail tampering is happening throughout the system and there is no accountability. We have evidence that some prisons are just "disappearing" the mail they do not like and it is becoming frequent that only through a third party do we learn that mail was sent at all.In two prisons our newsletter was not delivered to prisoners until two months after delivery to the prison- no notice , no explanation, and only after repeated complaints was it delivered at all. 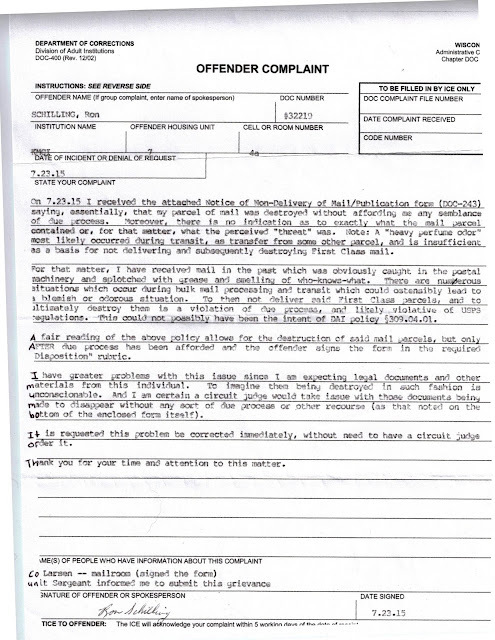 Parole hearing transcript 4 15-a good read. Before you read this transcript , we should review a little of Ron's Schilling's history- he was eligible for parole after 13 and a half years and has been in prison for 40 years. He has been to medium and minimum back and forth many times, has had jobs "outside the fence" and was granted parole by parole chairman Lenard Wells about 10 years ago only to have it whisked away . Wells was fired in a whipped up hysteria about releasing "murderers." We were not ready to give up our revenge only strategy. Are we ready now? DD: This is Doug Drankiewicz with the Wisconsin parole commission, and today's date is April 9th 2015. I'll be conducting interviews today at the Kettle Moraine Correctional Institution and recording these interviews with the use of a digital recorder. 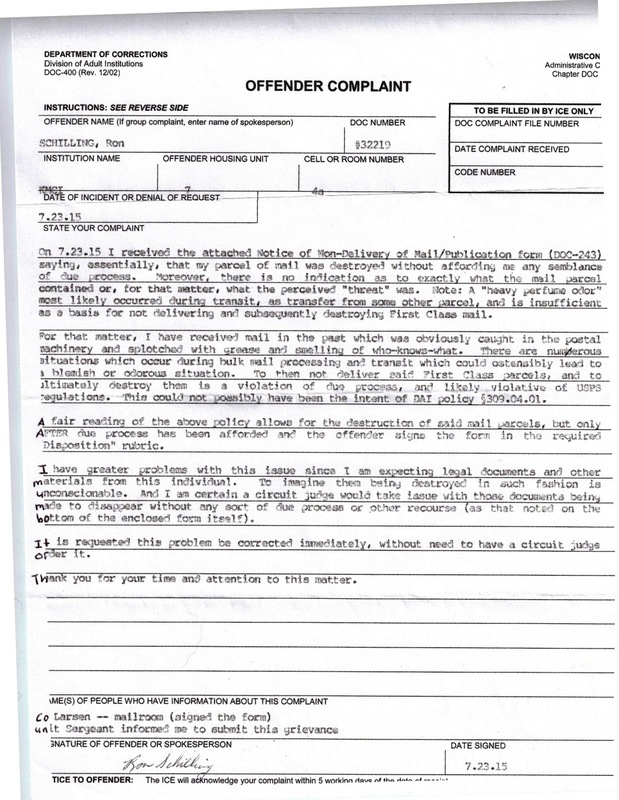 Prior to each interview I will be reviewing the inmate's file, including information in the Confidential File. Alright, just state your name and DOC number for the record. DD: Alright, Mr. Schilling, you remember my name is Doug Drankiewicz with the Parole Commission, and that's our digital recorder, so any questions that I have for you just respond verbally, okay? DD: Alright, so we're back on the CR-I0-096 case, first degree murder party to a crime, armed robbery party to a crime. And the sentence structure is life plus 5-years and you've now served approximately 39 years and 10 months. All that sound correct so far? DD: Alright. We've discussed this case numerous times so I'm just going to go right to the criteria for consideration here today. And first, in terms of conduct, I'm going to note just one minor conduct report since your last meeting with the commission in June of 2014; so you have 117 minors, 11 majors, and the last major was in 2011. I don't know if there's anything you want to say about not standing for count. RS: Actually, that one was a rather interesting day. They had a "fog alert" and it was actually an "emergency count," not at the scheduled times, and I had a room right by the driveway where the van comes in to pick up the count slips. I was standing for count. And then I saw the van come in and pick up the count slip and leave, so I sat down. And then he came around again and said that I wasn't standing count. And rather than fight it, I just signed it and accepted the punishment. I shouldn't have done that, actually, 'cause it probably would have been dismissed. DD: Alright, in terms of programming, no program needs are identified. In terms of release planning, nothing was submitted for this review. I'm wondering if you want to comment about any changes, or what your plans might be? RS: We can talk now about that? DD: Yes. Is this something you were prepared to talk about? RS: Sure. I purposely didn't submit one. The last one was approved and accepted and I can do better, though. And I've been trying to do better, and I've since made some connections in Watertown. DD: When you say that you can do better, you mean that you can develop a better parole plan than the one that was approved? DD: Is there some reason why you didn't want to present this in the form of a parole plan? RS: I haven't got it all together yet; I need to get more information. DD: Oh, so it's still developing yet. RS: And they offered to let me stay there free of charge until I can get on my feet, there's employment there, and housing, and transportation, and clothing and food, and everything that I could possibly need. And I'd be able to develop some music, which would be outstanding. DD: So we should disregard the plan, then, for David Faulkner? RS: Probably, yeah. Even though that would have been okay, it would have also been burdensome on David, and he's got enough problems. He's trying to help too many people - which is all good, I guess. DD: Alright, I have to tell you that based on our last conversation, I'm a little disappointed, to see you here. DD: Yeah. After outlast conversation it was made clear that the parole commission wants to see you transition through reduced security for some significant time to demonstrate for us that you're preparing yourself for release. RS: I didn't even bother going to see PRC last time because of the 12-month defer - that totally precludes any consideration from them for sending me to Minimum. And that's why I'm questioning your surprise or disappointment because it seems kind of pretentious when you give me a 12 and then say you expect me to get to Minimum when that's not possible. DD: It is possible. You might think it's not possible. DD: So you would transition through security, is that what you're telling me? RS: That's what I'm getting to on the second point. I've gone on with this before with you about the way that the victim's family members have traumatized me over the years, and it's been an ongoing process - forty (40) years of being messed with thoroughly. I don't know if you've read much of my letters in the file, but it's all fairly well documented. All of these family members have spread out through the whole system now; they're all superintendents and sergeants at all these Minimum centers, and every time I get to a Minimum center I'm not going to make it there. Theycan just jiggy me to easily and send me back for nothing - which is what they've been doing -- six times. I'm done with that. Why would I want to go back for a seventh time? And then you say that I need a sustained level of success at a reduced custody and that parole won't occur without that, and there's no way that it can happen. What am I supposed to do? Going back to Minimum and having them do it again is just going to - it's going to serve no purpose. I don't know what to do with it. homes for Bible study, and I had a lot of trust and latitude. And I have more than proved myself to be competent to be at Minimum. But when it came time to get messed with again and sent back - there's no stopping it. DD: And when you say "messed with," you're saying that there are direct ties there with the victim's family? RS: Absolutely. It's undeniable. And when you look at the circumstances of the tickets - the way that they hold PRC before the ticket's even written, all these things - it's just ludicrous. And I have no way to work around that. I've tried. I've worked harder than ten people when I work, I've got no problem with my work ethic; I've grown up working my whole life and the whole time that I've been locked up I've been working. Except since '97, I've been keptfrom a job. I've put in many, many requests - and I've just quit putting in requests. I would rather do things that are going to benefit me in the future, rather than take a job that somebody else can use. There are a lot of guys in here that can't get employment and are hurting real bad because of it. I wouldn't even feel good taking a job away from somebody like that - when I don't need it. But, I don't know, there's no way I can get a parole without staying at Minimum, and there's no way I'm going to stay at Minimum. So I'm stuck between a rock and a hard place, and I have no way to do anything about it. DD: I think I've voiced this to you in the past but I'll do it again today just so you can hear it again and, perhaps, digest it in a different way. But I think your thoughts on the victim's family and some connection to the Department of Correction are nothing more than distortions that you hold. And I think it's something that you need to try to overcome so you can be successful. RS: Really. You think it's all in my head? RS: You want some documentation - should I bring that? RS: We even talked about this last time - about Gerald Heeringa being on the parole commission. And you saying that he never did, when he did - and I've got paperwork with his signature on it from the parole commission. RS: And you're going to sit there and deny it, really? DD: I don't even know who that is. RS: I know it. Why don't you try and find out? DD: I've seen a list of parole commission members and that person's name is not on any list that I've seen. And I've been now having this conversation with you for 5 years, and I still don't understand it. And that's why I continue to tell you it's a distortion. RS: It's not a distortion. It's a fact. DD: Okay. If you were open to a transition to a lower level of security I would endorse that. But you've continued to make it clear that you're not going to do that because of these thoughts that you have about the victim's family. RS: My thoughts? I was jiggied six times and brought back from Minimum. DD: Is there anything else you'd like to talk about today? RS: Oh yeah, you betcha. This 5-year defer never happened? We've went around about that, too, right? That's all in my head, too? DD: I don't know anything about a 5-year defer. RS: The 4-year defer, that's in my head, too? The 5-year defer in '92 from Husz. I only had a 12-month defer on my paperwork, but be sent a 5-year defer up to the Warden at Gordon. DD: See again, those are - there are no "under-the-table" deferrals. RS: Stop it. There are too. RS: I'm sorry, too, that you would think that when I've got a copy of the memo. DD: I've got a list of your deferrals here, and the first few dozen are all just 12-month deferrals. There is nothing higher than a 12. RS: I mean, I would have no way of knowing that - that's my point, is that it's all secretive and I would have no way of verifying the truth or validity of anything that goes on with the COMPAS. DD: Again, it sounds to me like a paranoid distortion. RS: This is something that the system is doing, allowing any DOC employee - and there are a lot of them who are victim's family members and friends and friends of friends. DD: Any entries that are made into the COMPAS program leaves a footprint by the person that's there. RS: And I heard there's going to be an auditor, but I'm not sure bow efficient that will be. I guess that remains to be seen. DD: Is there anything else? RS: I wish you'd go through the record and find - find out the truth. I wish that you cared about the truth. I don't know what else to say, I really don't. DD: Having not heard anything from you in terms of interest in transition, I'm going to set this for another 12-months. Again, the admonition is you'll have excellent conduct moving forward —no major or minor conduct reports. And I still encourage you to consider the reduction through reduced security and to have that conversation with PRC. There's nothing about my deferral that prohibits you from transitioning. RS: Maybe you could tell them that. DD: I'll include it in my action. RS: Really. We'll see what that does. It was nice seeing you. RS: I seethe fog's finally clearing here. That is an excellent little recorder. God, I wish they'd let us have those. Okay. Have a nice day, and we'll see you next year. DD: Alright, good luck to you. DD: Mr. Schilling, is there anything else. RS: Yeah, I was walking on eggshells the whole time, obeying all the rules, being polite and courteous to everybody and helping out every chance I had, and I got jiggied anyway. Six times. And now you want me to do it a seventh time, thinking that, oh, maybe I'll be able to stay. Really? I don't know what we're going to do with this. We're at an impasse, here. They're not going to let me stay at Minimum. Don't you see that? DD: I don't see that. DD: I think that's the distortion that you hold that's holding you back. RS: It's all in my head, of course. It's convenient for you to say that. So what about this new Chairperson? We have a new Chair, huh? RS: Do you know anything about him? DD: Our meeting here today is not to discuss what I know or might know or what I don't know about anybody. RS: I'm going to have somebody Google him, anyway. RS: Yeah, he was the classification specialist at Oakhill, and I was digging through my files last night and found a letter to Stensberg dated back in 106. So as soon as I heard his name I knew he had popped up somewhere in my past. The COMPAS evaluation, what do you think about that? There's been a new training day that recently popped up and all DOC employees can now access this COMPAS thing and stick any kind of information in there that they want - and it's all secretive. We never get to find out what was said or who said it. DD: I'll note for the record that a COMPAS evaluation was completed and you scored "low" in terms of violence and "low" in terms of general recidivism. So it doesn't appear that somebody sneaking something in to make it look high-risk. We also forward blog comments to him; so if you would like him to write you back , please leave an address or email with your comment. release of lifer cases:is on the last?